Teeth cleaning costs are worth the investment because regular and deep teeth cleaning are investments in your future appearance, as well as your overall general well-being. A Yonkers dentist open on Saturday can answer no when you wonder, “Does teeth cleaning hurt?” Your dentist makes sure you’re as comfortable as possible. A dentist open on Saturday ensures you won’t have to miss a cleaning ever again. Everyone needs teeth cleaning every six months, no matter how old you are or what condition your teeth are in. You may even find yourself in need of a deep teeth cleaning if your dentist finds evidence of gum disease, which involves going below the gum line to ensure your mouth has been properly cleaned. But a regular cleaning from your family dentist can be easy if you’ve built a trusting relationship with your Yonkers dentist. Cleaning out plaque and tartar, if they’re present, and showing you how to maintain your smile between visits are all part of a top Yonkers dentist’s job. 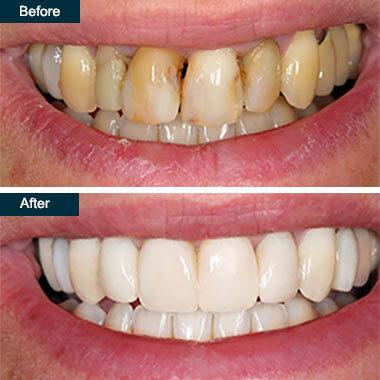 Regular cleanings, combined with the skills of a cosmetic dentist, can leave your smile looking brighter and whiter than you ever imagined. There are two types of procedures involved in teeth cleaning: one is the bi-annual teeth cleaning checkup and the other is deep teeth cleaning. Talk to your dentist about arranging a weekend visit if you can’t make it during the week. It’s far better than skipping your regular treatments. Regular teeth cleaning. This procedure involves checking for cavities, removing plaque, using a fluoride treatment, flossing your teeth and polishing them. Doing this twice a year keeps teeth from building up plaque and tartar. It helps your mouth stay healthy and free from further problems. The focus is on the teeth that are above the gum line. Deep teeth cleaning: If you’re at risk for periodontal disease, you may need deep cleaning, also called scaling or root planing. During this procedure, your mouth is numbed, and your dentist can focus on removing plaque, bacteria, debris and other problems happening below the gum line. A regular cleaning not only gives you a bright, clean smile, but it also keeps your teeth healthy. Medical conditions such as pregnancy, a disease like cancer and other changes that affect your body leave you more susceptible to having dental problems. That’s another reason to maintain your regular teeth cleaning appointments. You may ask, “Does teeth cleaning hurt?” The answer is no, but talk to your Yonkers dentist about your options for anesthesia; he takes every step to ensure your comfort. As you get older, it’s easier for bacteria to build up underneath your gums, and that’s where deep cleaning goes. The amount of deep cleaning you need depends on how much plaque and tartar you have. You may need to do as many as four visits, or as few as two. Your deep cleaning is something that can be accomplished any time, even by a dentist open on Saturday . Does teeth cleaning hurt — it’s something many people wonder about. A regular, above-the-gum teeth cleaning leaves you with little, if any pain. But if you’re having a deep teeth cleaning, your dentist can take care to ensure your mouth is numb before going below the gum line. The best dentist in Yonkers ensures you feel no pain. You might feel sore afterward, but that goes away in a few hours’ time. There are more risks associated with not having your teeth cleaned than with having them professionally cleaned. And if you’re pressed for time, seek out a dentist open Saturday, so you can get your teeth cleaned and not worry about work. Don’t be worried about teeth cleaning costs; the cost of not doing it usually is far greater than any out-of-pocket costs you endure now. And it’s a healthy choice to make for your body. Deep cleaning equates to a reduction in your risk for bacteria, infections, and other problems that can develop when teeth are left unattended. A top Yonkers dentist can tell you how often you need a deep cleaning to keep your mouth functioning properly. The reasons for deep cleaning vary. You may need it after having a tooth pulled, due to infection. You may want an implant, but your dentist wants you to have a deep cleaning first. In New York, cleaning by your hygienist can cost anywhere from $100 to $200, and deep cleaning, which must be performed by a dentist, can run more than $300, depending on many factors. Talk to your Yonkers dentist about payment plans if you don’t have dental insurance. Deep teeth cleaning can cause bleeding if your gums are infected. After the procedure, infection is rare, particularly if you don’t follow your dentist’s hygiene instructions carefully. Your dentist tells you if other problems were discovered during the deep teeth cleaning. You need to be aware of them and decide on further treatments. Future treatment options may include getting a dental bridge, or having implants put in after problem teeth have been removed. Ultimately, having your mouth properly cleaned helps you keep your teeth longer and possibly avoid dentures. But if you do need dentures, your Yonkers family dentist can safely and expediently advise you on the best course of action. Do you have any questions about the Teeth Cleaning (painless dental deep cleaning) procedure in Yonkers, Westchester NY? For more information or to schedule an appointment with the best rated deep teeth cleaning dentist of Park Avenue Smiles please contact our dental clinic for consultation.